Railroads played an important part in the settling of Manilla. To honor their railroad heritage, the Milwaukee Road Caboose Museum is found in the Bandshell Park. Schram Park has ball fields, tennis courts, and shelter houses. 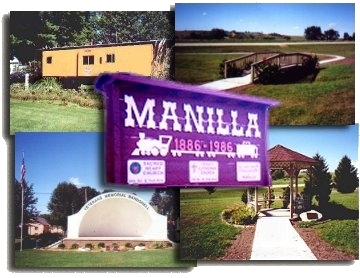 Manilla also shares a nine hole golf course, located east on Hwy. 141, with Manning. Every Fourth of July there is a parade and fireworks show. The third Sunday in October a craft festival is held. Manilla has a doctor and dentist available for their residents. Activities available for the citizens: Chamber of Commerce, Community Betterment, 4-H clubs, Lions, Scouts, Brownies, Masonic Lodge, Saddle Club and Mu Upsilon Sorority. Community churches: Sacred Heart Catholic, Trinity Lutheran, First Presbyterian and United Methodist.